This morning I have entered the Empire of Death. I am not trying to be overly dramatic. 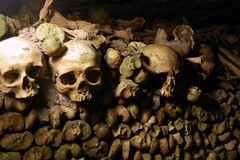 That’s what the sign at the entrance to the Paris catacombs tells me: “Arrête! C’est ici l’empire de la mort.” I feel well warned not just by that exclamation, but by the bilingual note affixed to the door outside. It says: “We inform people suffering from cardiac or respiratory insufficiency of risks related to the visit to the Catacombs. The ossuary tour could make a strong impression on children and people of a nervous disposition.” Rather sure that I don’t qualify under the former conditions, I wonder about the latter. I wasn’t feeling at all jumpy until now! Far below ground, it is a creepy, but not exactly frightening, place. Miles of disembodied bones line the paths of old stone quarries, neatly arranged into artistic compositions—femurs here, skulls there. It’s hard to believe that I’m looking at the remains of six million Parisians in this subterranean vault, nearly three times more than the number of souls living and breathing in the city proper today. From here I take the metro to Place Monge for a walk along the Rue Mouffetard, one of the city’s oldest streets. It is late morning by now and the neighborhood markets are bustling with people, despite a light rain. For the first time, I feel as though I have slipped through the invisible barrier separating “tourist” Paris from the “real” Paris. 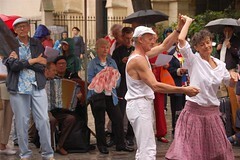 In the square in front of St-Médard church, a crowd has gathered to listen to classic French chansons performed by two men on their accordions. Under a circle of umbrellas, I watch transfixed as a couple in the center dances to the tune of “Le Mer.” In English, it means “Beyond the Sea.” It’s a popular standard in both countries, used in America for the closing credits in Finding Nemo, and as the title song for a movie about Bobby Darin. The dancers are light on their feet, unconscious of the weather. Her skirt swings as she pivots in his arms. I know that when I hear the melody again I will associate it always with this place and this day. I walk by fruit stands, butchers, and boulangeries, their windows filled to the brim with tempting treats. I devour a dish of oriental rose ice cream from “Gelati d’Alberto,” buy a box of Jeff de Bruges chocolates, and a delicate dragonfly pin in silver with green enamel wings made by a local artisan. Paris has been easy to admire, but hard to know. 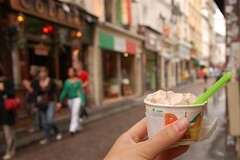 Here along the Rue Mouffetard, I feel at home. As the afternoon slips by, I decide to make a return visit to the Louvre, this time to the Richelieu wing to see Napoleon III’s apartments, the Rubens Room, and two of Vermeer’s best known works, “The Astronomer” and “The Lacemaker.” I visit the Musée de l’Orangerie as well to see Monet’s waterlillies, and then settle into the crowd outside to wait for the riders to arrive in the Tour de France. I am standing just off the Place de la Concorde, but the giant television screens that follow the race do little to tell me when they will arrive here. I listen for the cheers that roll like a wave through the city streets, and watch as the helicopters overhead swing around in my direction. They arrive in a pack and are gone in the blink of an eye. 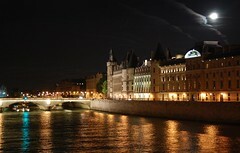 After the riders disappear down the Quai de Tuileries, I look down at the screen on my digital camera. I have managed to take just one picture and I’m not entirely certain that the blob of yellow color I see is a bicycle. It could just as easily be Sponge Bob Square Pants running underwater at the speed of light. Thank God they’re on a loop! Before the riders return, I set my camera to multiple exposures and bump up the shutter speed. I know nothing about cycling and never cared to watch the Tour de France on TV before, but being here in person has its own unique excitement. I am not near the finish line on the Champs-Élysées, and when it’s crossed at last, I am not there to see it. Like most in the crowd, my interest is tangential, my attention more on the lively atmosphere than the sport itself. It would be nice, though, if when I sort through my pictures later, I find that I captured the winner in one of the frames. After a delicious dinner at the “Royal Thai” on Rue des Fossés Saint-Jacques, just around the corner from my hotel, I end the night with a sunset cruise aboard the Vedettes du Pont-Neuf. It’s a beautiful night, and by the time we arrive back at the bridge, there is a full moon rising high over the Île de la Cité.